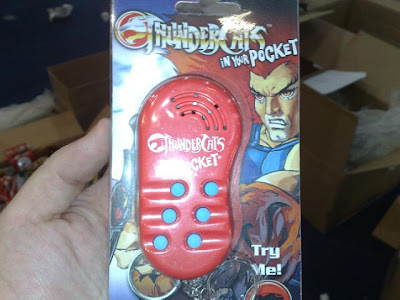 As promised here is the first ever image of the Thundercats In Your Pocket that I helped create. It's not a big deal for most people but being the huge 80's fan that I am I'm proud that I had something to do with at least one TC item that'll be bought by fans young and old across the globe. The image was taken today by a colleague who was setting up our company stand at the London Toyfair. Thanks Danny boy! I can just hear the music now... "da da daaaaa... Thundercatssss..."